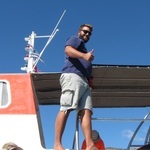 Damulis, our boat pilot in Crete, opened the Notos Mare dive school in 2004. As a qualified PADI instructor he has intimate knowledge of Crete’s underwater scenery. Damulis knows all the secret spots from years of exploring in his boats and escorting divers along the south west coast of the island! He is also experienced in rescuing stranded tankers and plaiting ladies hair! His dive boat and support boats all have sturdy ladders so there’s no need to clamber over the side. Damulis has been skippering for SwimTrek in Crete since 2015.